The tonsils are a pair of lymphoid tissues located on the sides at the back of the throat. Tonsillitis is an infection of the tonsils caused by bacteria or viruses. This condition is common in older children, but is unusual in infants and very young children. The symptoms of mild tonsillitis are a dry, sore throat, bad breath, and swollen glands in the neck and jaw; more serious problems may occur, such as blocked breathing or difficulty in swallowing. Tonsillitis caused by bacteria, usually streptococcal bacteria, is treated with antibiotics. If tonsillitis is caused by a virus, antibiotics are not useful. Treatment is aimed at making the patient feel more comfortable until the swelling and soreness are relieved. In some children, tonsillitis may become a chronic condition. If inflamed tonsils improve only after repeated courses of antibiotics or if they interfere with sleep or school and lead to problems in breathing or difficulty in swallowing, the tonsils are usually removed. This operation is known as a tonsillectomy. When tonsillitis is suspected, an examination of the back of the throat will be done. Red, swollen tonsils indicate infected tonsils. If the infection is caused by bacteria, an antibiotic will be prescribed. 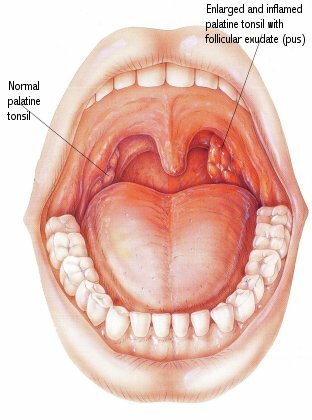 The tonsils are located on the sides of the back of the throat, and medically are known as the palatine or faucial tonsils. They are lymphoid tissues and their function is to help defend against infection. The condition known as tonsillitis may occur if the tissues themselves become swollen and infected by bacteria or viruses. Tonsillitis is very common, especially in the late childhood years. The condition is most often caused by streptococcal bacteria, although it is sometimes caused by viruses such as the Epstein-Barr virus, which also causes mononucleosis. Tonsillitis may also be present with diphtheria, today a rarely seen bacterial infection since the introduction of a childhood vaccine against diphtheria. Primary Symptom: The primary symptom of tonsillitis is a sore throat, usually made worse by swallowing, and pain is sometimes felt in the ears. Other symptoms, especially in young children, include fever, headache, loss of appetite, vomiting, bad breath, swollen and tender lymph glands, a hoarse voice, and a general feeling of fatigue. In severe cases, there may be difficulty swallowing or breathing due to the enlargement of the tonsils. Examination of the back of the throat will show red, swollen tonsils. The infected tonsils may have pits, or deep crevices, filled with pus. There may be a thin, white covering over the tonsils that peels away without bleeding. A swab of the infected area and a culture of the swabbed materials will reveal whether the tonsillitis is caused by bacteria or a virus. A test for mononucleosis may be helpful if symptoms point to that condition. A blood test to measure the white blood cell count may also help determine if the infection is bacterial or viral. Treatment: The treatment of tonsillitis begins first by making the patient more comfortable, and includes plenty of fluids and bed rest. Aspirin should not be used to treat fever in young children to avoid the risk of developing Reye’s syndrome. Fever should be treated with acetaminophen or ibuprofen instead. The patient may that find gargling with warm salt water or sucking on a throat lozenge will relieve the pain of the sore throat. If the throat culture shows a bacterial infection, an antibiotic will be prescribed. Antibiotic therapy should be continued for a full 10 clays to prevent the reappearance of tonsillitis. In some cases, throat cultures of family members living in the household are performed to identify carriers of streptococcus bacteria who may be reinfecting the patient. In some patients, tonsillitis returns rapidly after adequate treatment with an antibiotic. In others, the chronic infection of the tonsils causes problems in swallowing or breathing, especially at night. Surgical removal of the tonsils to prevent these problems was done routinely in the past; more recently, tonsillectomy surgery is held off if feasible and may be avoided altogether. Tonsillectomy may or may not require a hospital stay, depending on the patient and the severity of the situation. If you are diagnosed with tonsillitis, follow your doctor’s instructions carefully. If you are taking an antibiotic for bacterial tonsillitis, be sure to finish all the medication even if your symptoms disappear. Talk to your pharmacist if you have questions about your antibiotic, or if you need to choose a nonprescription lozenge to soothe a sore throat.